Experimenting with hydroponic gardening is a fun and productive way for greenhouse hobbyists to expand their horticultural knowledge. The term “hydroponics” is a general name that encompasses all methods of soilless gardening. In other words, there is a multitude of ways to garden hydroponically. However, don’t let the seemingly infinite amount of hydroponic systems deter you from giving hydroponics a try. One of the best ways for greenhouse hobbyists to break into hydroponic gardening is by making a homemade hydroponic system. There are countless plans on the internet for do-it-yourself or DIY hydroponic systems. These systems can be built from materials commonly found at home, online or at a local hardware store. With so many hydroponic systems to choose from, a gardener can choose the hydroponic DIY project that meets his or her budget and remains within their comfort zone in terms of construction difficulty. Each type of hydroponic system can have hundreds of possible variations, offering the grower the ability to tweak a particular system to best meet his or her desires. 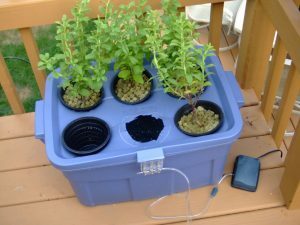 A closer look at some of the most common self-built hydroponic systems will give hobbyists an idea of which system may be the best fit for them. People all over the world are using and creating different types of hydroponic systems. Each of these systems can have multiple variations, but the core concept for each system remains the same. The following are general descriptions of each system which can be further customized to meet the particular needs of the horticulturist. Deep water culture, or DWC, is a very common type of DIY hydroponic system. This is most likely because a single module can be built out of little more than a five gallon bucket and a small aquarium air pump and all for less than ten dollars. In a deep water culture system, the majority of the plant’s roots are submersed in a nutrient solution which is continuously aerated to keep the dissolved oxygen levels in check. Homemade DWC systems can be as simple as a hole cut in a bucket lid for plant placement and an air pump for oxygenating the root mass. They can also be as advanced as multiple connected plant modules with multiple air pumps and a water chiller unit. The major advantage of a DWC system is the tremendous speed of plant growth due to the readily available nutrients and oxygen in the root system. The biggest disadvantage of a DWC system is susceptibility to temperature fluctuations. Because the roots are submersed in the nutrient solution, warm water temperatures will deplete the amount of oxygen available to the roots (even with an air pump supplying aeration). Smaller deep water culture systems (1 – 6 buckets) are great for experimentation because they are relatively easy to maintain. However, gardeners looking to set up more than six modules should plan on purchasing an industrial air pump and a water chiller to maintain cooler temperatures and maximize dissolved oxygen around the submersed root mass. Top feed hydroponic systems are systems where the nutrient solution is delivered from the reservoir to the base of each individual plant via a feed-line. The main reservoir generally houses the submersible pump which is connected to a main-line. Once the main-line is pressurized, it pushes nutrient solution through each feed-line. Top feed systems can be set up as either a run-to-waste or recirculating system; the latter being the most efficient option. Plant modules for homemade top feed systems can be built from buckets, yogurt containers, plastic cups, or just about anything else that can hold water and medium. A common solution for a homemade reservoir is a large Rubbermaid® container or a feed trough. Be sure to get the right size pump for the job. This will be determined by the length of the main-line and the amount of feed-lines needed. Ebb and flow, also known as flood and drain, hydroponic systems rely on a reservoir, a trough or table, a submersible pump for water delivery and an overflow drain. Ebb and flow systems are very efficient systems and are easy to build and maintain. Simply put, they are a great choice for greenhouse hobbyists looking to experiment with hydroponics. The table or trough for a homemade ebb and flow system can be made from wood and pond liner and the reservoir can consist of a large Rubbermaid® container. The submersible pump delivers the water to the table or trough for a given period of time. After the pump turns off, gravity returns the nutrient solution back to the reservoir for later use. There are many different ways to set up an ebb and flow system and many different materials that can be used for the construction. Ebb and flow systems can be designed to fit in virtually any garden space. Nutrient film technique, or NFT, is a system made popular by commercial lettuce growers. NFT systems utilize a series of gutters or troughs which are angled slightly. With the help of gravity, the nutrient solution flows down the slight angle to the reservoir or to the next gutter or trough in the series. A submersible pump in the reservoir creates a slow, but continuous, flow of nutrient solution. This slow flow of nutrients produces a “film” at the bottom of the gutter or trough, hence the name “nutrient film technique”. Homemade NFT systems are commonly made from PVC pipes, plastic house gutters, or plastic fence posts. Dialing in the rate of flow is an important step in homemade NFT systems. Be sure to know the height of the overall system before purchasing the pump. Vertical hydroponic systems are another popular type of DIY hydroponic systems. Vertical hydroponic systems can be built from a wide variety of materials, but many home hobbyists choose PVC piping. 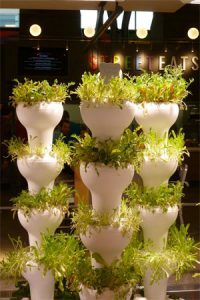 Vertical hydroponics refers to the way the plants are positioned in a vertical manner instead of the typical horizontal orientation. In other words, the plants are set up to maximize the floor space by being “stacked” on top of one another. 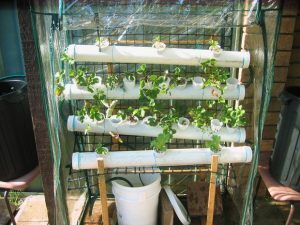 Homemade vertical systems can consist of small modules that are stacked or a PVC pipe (6 – 8 inches) with holes drilled throughout for planting. A feeding tube (1/2 – 1 inch PVC) is wrapped in a material to hold the moisture and placed in the center of the large PVC pipe. The nutrient solution is delivered via the feeding tube and the outer PVC pipe holds the plants in place. The biggest advantage of a vertical hydroponic system is the maximization of floor space. The biggest disadvantage is its difficulty for novice hydroponic gardeners. DIY vertical hydroponic systems can be a little more difficult to set up and maintain when compared with other commonly used homemade hydroponic systems. Put another way, these systems are great for growers with some hydroponic experience or for those who are more mechanically inclined. Hydroponic systems must use some type of nutrient solution because there is no soil to supply essential elements to the plants. There are many different brands of hydroponic nutrients available. It is very important to get a base nutrient that contains all of the essential elements needed by plants. Base nutrients typically come in a one-, two-, or three-part formula. Most beginner hydroponic gardeners should start with the one-part formula and work their way up to a three-part formula (which allows more customizability). Base nutrients are categorized by the stage of growth they help promote. For example, for the vegetative stage of growth, a “veg” or “grow” base fertilizer should be used. For the fruiting or flowering stage of growth, a “flower” or “bloom” base fertilizer should be used. It is also important to monitor the pH of the nutrient solution so the solution doesn’t become too acidic or too alkaline. An inexpensive pH “dropper kit” is a great place for most home hobbyists to start. Aquaponics is the combination of aqua farming (fish farming) and hydroponic gardening. The main idea behind aquaponics is the fish waste is used as fertilizer for the plants. As the plants use the fish waste, the water is essentially filtered, making aquaponics a mostly self-sustaining system (minus the fish food). Any of the previously discussed hydroponic systems could potentially be used in an aquaponics system. It is fun to experiment with aquaponics; however, novice hydroponic gardeners might be better off dialing in a hydroponic system before attempting to add fish into the mix. When building a homemade hydroponic system for a greenhouse, it is advantageous to paint the exterior of the system with a UV protectant paint made for plastics or to use UV protected plastic. Without UV protection, the plastic will degrade over time and eventually deteriorate. If the system uses buckets or other plastic containers for plant modules, be sure the containers are made from food-grade plastic. This is especially important if you are planning on consuming the vegetables or plants being grown. As with any construction project, building a hydroponic system is much easier if a gardener has the right tools for the job. Hole saws are relatively inexpensive and are indispensable when it comes to drilling holes for hydroponic connection fittings. After drilling a hole in any type of plastic container, a light scraping around the circumference of the hole with an X-Acto® knife or scalpel will remove any loose plastic that could potentially cause the grommet or fitting to seal improperly. A grommet or fitting that is not properly sealed could leak and is difficult to repair when the hydroponic system is operating. Put simply, it is best to make sure all fittings and pieces of the hydroponic system fit properly before water actually enters the hydroponic system. Plastic is not cheap so it behooves a grower to measure twice and cut once. Proper planning and forethought of the layout of the hydroponic system are important to the building process. Be sure to keep in mind that the plants will become larger as they grow so proper spacing is required for healthy growth. Building a hydroponic system is a fun and inexpensive way to experiment with soilless gardening. Not only do homemade hydroponic systems offer monetary savings, they also offer a grower the ability to further customize his or her system to best meet their needs. For novice hydroponic gardeners, building a hydroponic system will automatically heighten one’s knowledge about how hydroponic gardening works and why it works so well. There is virtually no limit to the simplicity or complexity of a homemade hydroponic system. In-depth plans for virtually any type of hydroponic system can be found online. So, what are you waiting for? Go find a plan, purchase some supplies, and get growing! Eric Hopper resides in Michigan’s beautiful Upper Peninsula where he enjoys gardening and pursuing sustainability. He is a Garden & Greenhouse contributing editor and may be contacted at Ehop@GardenAndGreenhouse.net.